Lemon Meringue Pie – this recipe is a family favorite! 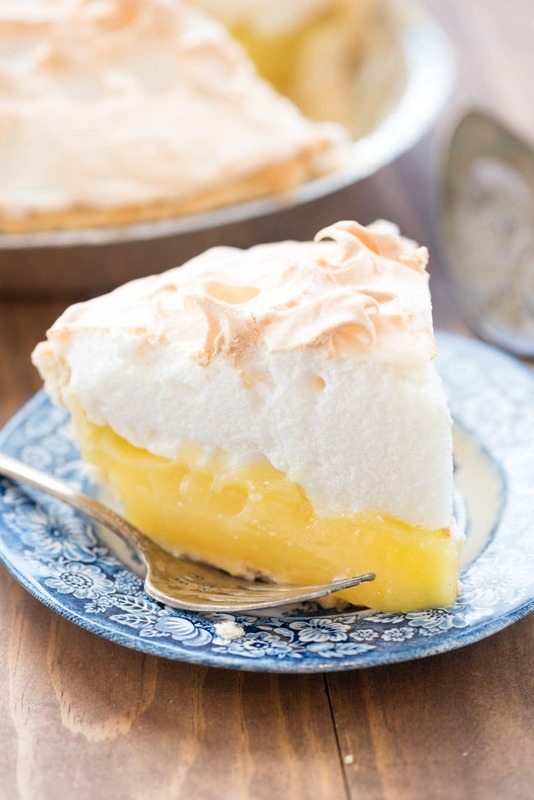 It’s an easy pie recipe with homemade lemon filling and meringue. Everyone loves it! Thanks to Relative Race, I’m sharing this lemon meringue pie recipe with you! When I was a kid (and even still) whenever pie is mentioned around my dad, he brings up my Great Aunt Tootsie’s Lemon Meringue Pie. He talks about how the crust was amazing and the filling was so smooth and perfect. His Aunt Tootsie was his mom’s sister, and I honestly don’t remember ever meeting her. I think, between my Nana and Tootsie, that the latter was the baker in the family. My Nana could bake, sure, but meals were her specialty (and her cookies were actually Pillsbury…which I didn’t know until I was an adult). By the time I was in my early 20’s, both my grandmothers had passed, and with them, their recipes. My mom’s mom didn’t write anything down, but my Nana had a recipe book that my aunt took when she died. A few years ago, she sent me an envelope full of hand written recipes and newspaper clippings that had been shoved in my Nana’s recipe book. One of them was for Lemon Meringue Pie. I decided I had to try to make it, and now I finally have! I absolutely love old family recipes. I think the ones that are handed down between generations are some of the best, don’t you agree? Food and memory are intertwined so much; just a bite of a meal your grandma used to make can bring back vivid memories; even sights and smells and sounds from the time you used to eat it. That’s what I was hoping to create with this pie recipe, because I’m going to make it for my dad someday. Making Lemon Meringue Pie seems like an involved process, and it can be, but it’s worth it. I would give it a medium on the scale of easy to hard, but this recipe is easy to follow and while it has some moving parts, it’s totally attainable. I’ve talked at length before about how I prefer marshmallow meringue to traditional (and I mean, how can you not love a gooey melty marshmallow?) but I think that’s because I’ve never had a GOOD traditional meringue pie before. 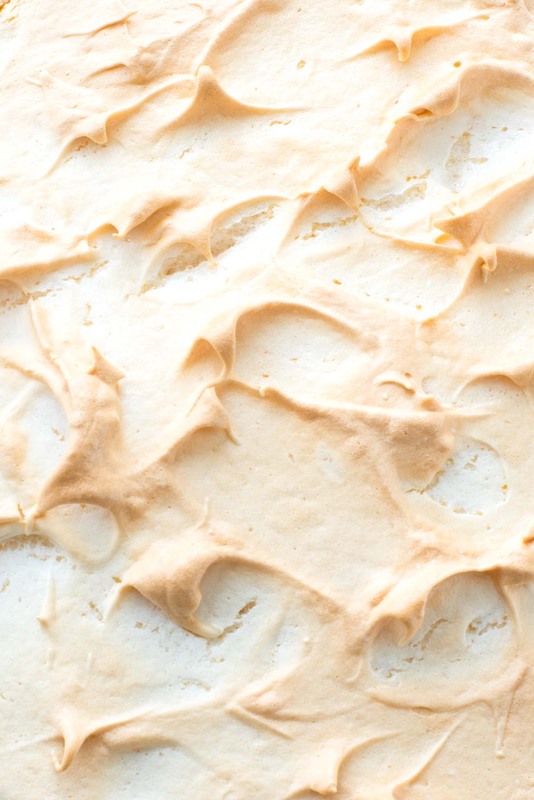 THIS meringue is super easy to make and tastes wonderful. It’s not soggy or eggy – it’s the perfect complement to the sweet and tart lemon filling. One of the ways to make this pie much easier is to use a pre-made crust. I love my all butter crust recipe (it can be frozen, BTW, for later use) but in a pinch or when I’m making an already involved recipe, I’ll start with a premade crust. Make sure to pre-bake and cool it before you start making your recipe. The filling is already cooked and the only reason it’s baked is to set and brown the meringue. The lemon filling for the lemon meringue pie is an easy lemon curd-like recipe. It’s cooked on the stove, thickened with cornstarch and egg yolks, then strained into the baked pie shell. I always like to strain it because no matter how careful you are when tempering your eggs, some little bits of cooked egg might happen. Straining it takes all those bits out and leaves you with a smooth and silky filling. The meringue whips up easy with a hand or a stand mixer. Don’t leave out the cream of tartar; it’s important for stabilization. You can find it near the spices in the grocery store, and don’t worry, you’ll use it in my sugar cookies and snickerdoodles, so it won’t go to waste. Once it’s all assembled (see the video below), you just have to bake it until the meringue on top is all brown and toasty. The hardest part is letting it cool until it sets! My Aunt Tootsie’s Lemon Meringue Pie is perfect for any family gathering! I hope you enjoy this pie as much as my family has, and that it becomes part of your family tradition too. Don’t forget to temper your eggs. This is done by pouring a bit of the hot lemon mixture into the eggs while whisking, then pouring the eggs into the rest of the lemon mixture. It’s done so the eggs come to temperature slowly (otherwise you get scrambled eggs). Straining ensures that your curd has no egg bits or other lumps. To reduce the risk of weeping meringue, make sure that the meringue touches the crust on all edges. Aunt Tootsie's Lemon Meringue Pie - this recipe is a family favorite! 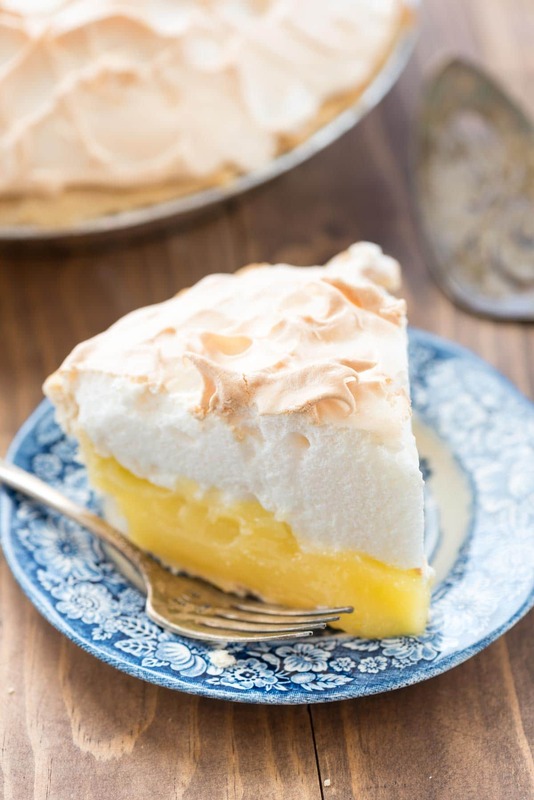 It's an easy pie recipe with homemade lemon filling and meringue. Everyone loves it! Make sure your pie crust is baked and cooled in an 8-9" pie plate. Whisk water, sugar, cornstarch, salt, lemon juice, and lemon zest in a medium saucepan. Place over medium-low heat and cook, stirring often, until it’s thick and bubbly. Place egg yolks into a medium sized bowl. Whisk them gently. Once the lemon mixture is thick and bubbly, carefully pour about half the lemon mixture into the egg yolks, whisking constantly, then place the egg mixture back into the pan with the remaining lemon mixture, continuing to whisk. You want to avoid scrambling the eggs. Bring to a gentle boil, then cook for 2 minutes. Remove from heat and stir in the butter until melted. Pour mixture into the prepared pie crust. (If so inclined, strain it into the pie through a mesh strainer to remove any egg bits.) Cover with plastic wrap while you prepare the meringue. Place egg whites, cream of tartar, and vanilla in the bowl of a stand mixer fitted with the whisk attachment (or you can use a large bowl with a hand mixer). Beat on high speed until soft peaks form (if you remove the beaters the tips curl slightly) and then continue mixing while gradually adding the granulated sugar. Continue mixing until stiff peaks form (they’ll be glossy and stand straight). Spread the meringue on the top of the lemon mixture in decorative peaks, being sure that the meringue touches the crust and no lemon shows through. Bake about 30 minutes or until the meringue is browned. Cool at room temperature for one hour, then chill at least 5 hours before slicing. The pie will last a day or two in the refrigerator but tastes better day one. This post has been sponsored by BYUtv and Relative Race. All opinions are 100% my own. Perfect balance of sweet and tart. Easy meringue. Made this for Christmas, the filling didn’t get think with 5 tablespoons of cornstarch, which is the main thickening agent, instead, I added one more tablespoon and the mixture thickened up right away. All in all though, great recipe. Perfect amount of filling and topping for a 9″ deep dish pie. I used my own pastry recipe but your filling and meringue recipe was perfect and delicious. I have made hundreds of lemon pies in my time and this is the best yet. I am 80 years old and my wife of 59 years come this June 25th is in late stage Alzheimer’s … so I am her caregiver and Chief cook & bottle washer … among all other duties !!! This was my first rodeo in the pie baking category … and last fall I became a QVC junkie … purchasing a KitchenAid 6 quart stand mixer. While I have used it to make mock turtle soup (acquiring also a KitchenAid meat grinding attachment) I decided to make “Aunt Tootsie’s Lemon Meringue Pie” Even though it took me approximately 7 hours from start to finish (including cleanup) I doubled the ingredients to make two pies and shared them with excellent reviews … they tasted yummy even though I violated the making of the meringue by getting some egg yolk in the whites mixture ( actually ended up tasting more like marshmellow than meringue ) but the pie being delishious just the same. I also did make the butter crust that was part of the recipe even though my bride has the best pie crust recipe which my daughter always uses whe making my favorite cherry pie !!! I’ve made this recipe about five times and it’s wonderful every time. I don’t change a thing and it comes out delicious. If I have my own butane torch can I use that instead of baking the whole pie? Or does the filling need to bake as well?